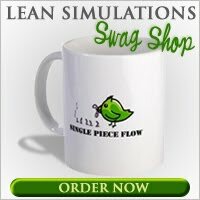 Lean Simulations: Lean Production Cell - What is it exactly? Lean Production Cell - What is it exactly? In what appears to be a series on lean production cells and U-shaped cells, I bring you yet another video showing a lean or circular work cell. What's a lean production cell? One work cell produces a family of parts. Machines are grouped together to reduce inventory and motion. Labour can be easily balanced within the work cell. Labour can be flexible depending on the customer demand. Traditional manufacturing focused on large batch sizes coming from each process. A machining centre that makes hundreds of parts, then sends them across the plant to the grinding area, which finessed the parts and sends them off to final assembly. A lean work cell contains everything you need to make a part. No more large batch processes with WIP in-between. No more transporting parts to the next department on the other side of the factory floor. The challenge can be finding inexpensive ways to perform higher duration and higher cost processes, like painting, curing, molding, coating. . . processes that require expensive specialized equipment. Sometimes there's no easy solution, but the closer you can get to single piece flow, the shorter your lead time becomes and the more flexible you become. Due to youtube fuzziness, I can't be sure of the exact process steps, or what is being manufactured, but one thing caught my eye. The blue box in the background is like a black box. . . who knows what's going on inside. It has a cycle time that's longer than the other steps. The operator loads big blue, then moves to the back of the box and picks up the completed part from the previous cycle. Around the 30 second mark, the blue box cycle is completed and a part pops out. Voila! The operator doesn't care, because she's moved on to the next step and beyond. There's no waiting for the machine, as the time is filled up with additional value added steps. Each part is completed from start to finish, one at a time, with no WIP inventory. You could easily add two more operators in here and triple the output if the requirements go up. Why work in a circle? At the end of each cycle, the operator is right beside the start point again. If I were to make any further changes, I would move the work stations closer together to reduce some of the walking. In particular, the station on the left is pretty far, and the box on the weigh scale takes up a lot of room. Perhaps turning the box so the operator is presented with the short end could help tighten up the work cell. It looks like the operator is just dropping the part in the box anyway (scale measures the quantity). Lean is a continuous process and once you make change like this, you're sure to notice more opportunities. The U-shaped production cell - Slow down to become more lean.